Picasso made this artwork for Gerard, Ines'son in 1955. Ines Sassier was one of Picasso’s best friends, she was very close to Picasso from 1936 until the end of his life. Picasso's children: Paloma, Claude & Maya loved Ines Sassier. Maya Picasso said "Ines was more than a family member, an aunt, or a grandmother...when Ines saw me for the first time, I did not even walk yet." The cut-out has been framed with glass on the front and the back, to show both sides of the drawing. The subject " Mousquetaire " was a recurring theme in Picasso’s last years. This very rare work is from the Gerard & Ines Sassier Collection. 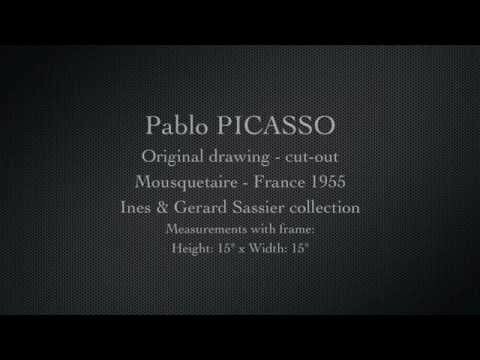 Picasso made this work for Gerard and Ines' son in 1955. Condition: Excellent and original condition. New frame. Measurements: Drawing - H: 4"1/2 x W: 4"
Frame - H: 15" x W: 15"